Sri Chinmoy (1931-2007) is a spiritual teacher who dedicated his life to the pursuit of world harmony. He feels that through leading a balanced life of spirituality, meditation and selfless service we can reveal our true inner potential and love of humanity. Sri Chinmoy lived an active life, showing that meditation can also lead to a productive outer life. He was a prolific writer, writing over 1,500 books and painting over 13 million soul birds. 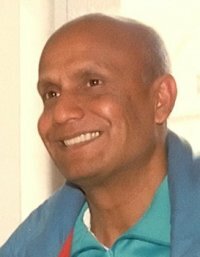 Sri Chinmoy was also an accomplished musician and composer. He has composed approximately 23,000 songs, including 13,000 in his native Bengali. For over 35 years Sri Chinmoy offered prayers and mediations at the United Nations in an attempt to foster greater world harmony. Sri Chinmoy has created many new initiatives to foster his ideal of world harmony. These include the Peace Run which seeks to spread friendship and harmony through a global relay torch run. Another is the Oneness-Heart-Tears and Smiles humanitarian aid project. Through his spiritual activities and initiatives he seeks to inspire others to lead a better, more fulfilling life. For more on Sri Chinmoy, please view our links page.